According to a recent survey, 40 per cent of people undertake renovations to improve the look of their home, while 33 per cent do it to add value*. As house prices continue to rise, home improvements are a top choice for British families. The research revealed that aesthetic alterations (47%) and redecorating rooms (46%) were two top priorities for home owners looking to add value to their home. So, if you’re looking to refresh your home with a new look that will add value to your home, there is one very effective solution that will make a real difference…upgrading your stairs. The hallway is one area where simple changes can have a big impact. 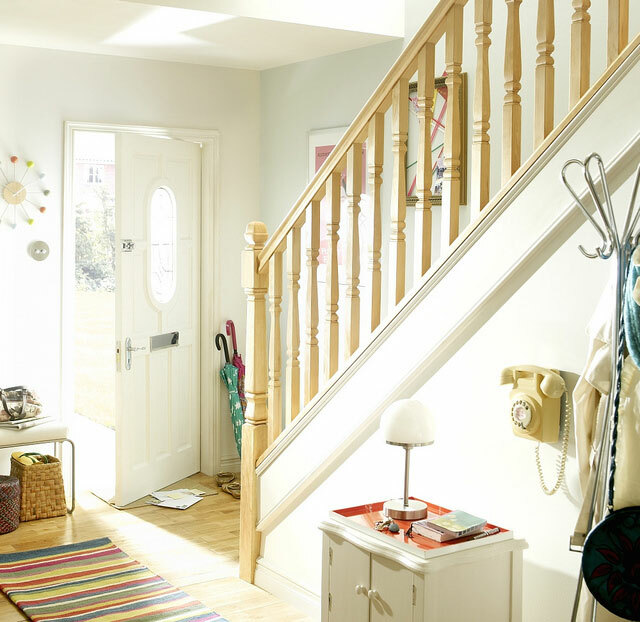 Replacing the stairparts can create a stylish centrepiece and that all important ‘wow’ factor when you walk through the door… and better still it’s easier and more cost effective than you might think. When selecting the type of wood for your staircase, consider the materials that have been used elsewhere in your home. For example, white oak is a popular choice for flooring, doors and kitchens, so if this is used in other other areas of your home, continue the theme throughout, by selecting the same wood for the stairparts. Such attention to detail creates consistency, resulting in a unified look and feel. When it comes to fitting pre-drilled handrail and baserail systems with pre-cut spindles make installation easy, while ready to finish stairparts mean there is no need to wait for paint or varnish to dry, saving time, while minimising mess and disruption. The Elements with Glass range from Richard Burbidge features striking glass infill panels reflect light and will make your hallway appear more spacious and light. Exuding luxury, the Elements range offers an affordable way to make a real style statement, creating a stunning centrepiece in your home. Available in white oak it is supplied with gun-metal connectors or fittings, and is also available with a choice of solid metal spindles.